The standard light fixture mounting box as shown below are only designed to hold standard light fixtures weighing up to 25 pounds. Any light fixture weighing more than that the weight needs to be supported independently from the mounting box. 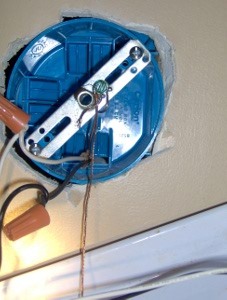 If you are installing a light fixture and hooking it up to the older 2 wire system, it is recommended to install a jumper wire from the grounding screw to the wire nut where the white(neutral) wires connect. Where referenced below "the supply wire" refers to the wire suppling the electric to the light fixture. To prepare the wires for connecting them together strip the plastic down from the end of the wire half of an inch. Install the light fixture mounting bracket onto the light fixture box(first picture above). 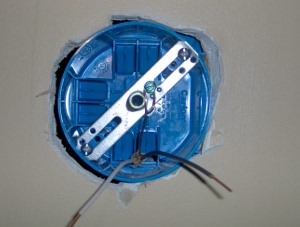 Install the bare copper wire(ground) and the ground wire from the light fixture to the grounding screw located on the mounting bracket for the light fixture. Connect the black(hot) wire from the supply wire to the black(hot) wire from the light, twist together and install a wire nut to cover the exposed ends. Connect the white(neutral) wire from the supply wire to the white(neutral) wire from the light, twist together and install a wire nut to cover the exposed ends. Mount the light fixture onto the mounting bracket and install fasteners. Turn on the light and enjoy.